Though Godard was benched for just about half the season, he did his job when called upon. 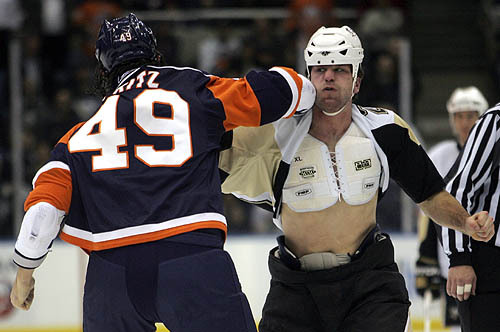 Along with Mike Rupp, Godard took on the role of the “Enforcer” and he did it well, just ask Riley Cote or Colton Orr. As much as Eric did on the ice, he did much more off the ice. Eric is known for his gracious work with Pittsburgh area hospitals. He visit’s the sick children, brings them gifts and always puts on a smile on their faces. It’s awesome to see an “Enforcer” have such a caring touch. We expect Godard to go out and do what he has been doing, knocking some lights out. He does what we expect him to do, he sure is. Staying with the Pens in 10-11? At this point he's not, going anywhere.